Martin Hamilton-Smith has raised the eyebrows of his former Liberal colleagues by rebranding himself in his inner-southern suburban seat of Waite with a colour scheme strikingly similar to that used by the Xenophon political juggernaut. 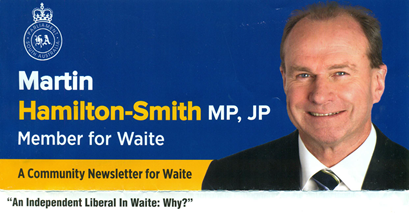 Hamilton-Smith’s latest e-newsletter to constituents has abandoned the blue favoured by the Liberal Party that he led for two years, before later quitting to join Jay Weatherill’s frontbench in 2014. Instead, it is bathed in an orange hue eerily reminiscent of that used in branding for the Nick Xenophon Team, which picked up three senate seats in this year’s federal election and gained the lower house seat of Mayo, which adjoins the state seat of Waite. While both Hamilton-Smith and Xenophon have long denied any formal association, Liberal observers have no doubt the move is designed to align their former colleague with the ever-popular crossbencher in the hope of picking up votes from electors weary of the two major parties. Hamilton-Smith told InDaily he was “experimenting with some new badging”, but insisted: “I think you’ll find it’s slightly different from Nick’s”. “I’ve only changed my calendar and online newsletter at the moment, and I’ll see how that’s received and see where we land in the new year,” he said. BEFORE: Hamilton-Smith’s newsletter earlier this year. AFTER: How it appeared this week. A former state MLC, Xenophon has long been seen as a magnet for independent aspirants, with one-time Labor MP Kris Hanna unexpectedly re-elected in Mitchell in 2006 after receiving the crossbencher’s endorsement. Hamilton-Smith conspicuously handed out How To Vote cards for successful NXT candidate Rebekha Sharkie in Mayo on polling day this year. “I supported Rebekha because I thought she was by far and away the best candidate in Mayo,” he insisted. He reiterated that “Martin will not be an NXT candidate”. “I think it’s pretty clear he’ll be running his own race,” he said. But he did suggest his party, which has both major parties terrified in traditional strongholds ahead of a mooted state election push, was unlikely to run against Hamilton-Smith in Waite. “At this stage the thinking is to run in half a dozen seats, so the short answer is that isn’t anywhere near the top of our priority list,” he said. State Liberals have a pairing arrangement whereby every Upper House MLC is given responsibility for helping co-ordinate the campaign of a lower house seat in their area. Ridgway is nominally paired with Elder, but has also overseen a virtual campaign designed to keep the Liberal brand visible in Waite. “Obviously I live there so that’s just to get the pot on the stove and keep it simmering,” he said. “I’m the contact point for all the Liberals [in the seat]… people contact me that don’t want to speak to Hamilton-Smith. That, however, will depend heavily on the final report of the Electoral Districts Boundaries Commission, which will be handed to the Governor tomorrow before being released publicly on Thursday. Waite is one key seat whose borders could change markedly, with the draft report suggesting a revamped electorate containing only around a third of the current seat, instead taking in substantial chunks of neighbouring Davenport, Fisher (which will be renamed Hurtle Vale) and Heysen, currently held by one of Hamilton-Smith’s most bitter foes, Isobel Redmond, who succeeded him as Liberal leader in 2009. Ridgway suggested several aspiring candidates were waiting to see which way the boundaries fell, which would determine which sub-branch members they would need to win over to gain endorsement. InDaily understands several veteran MPs from both major parties are waiting for the boundaries review to be finalised before deciding whether to stand again.